IDIOMA: Inglés Nuclear models and stability. 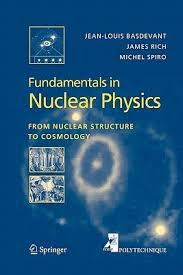 - Nuclear decays and fundamental interactions. - Radioactivity and all that. - Fusion. - Nuclear Astrophysics. Etiquetas: Fundamentals in Nuclear Physics, Fundamentals in Nuclear Physics – Jean-Louis Basdevant, James Rich, Jean-Louis Basdevant / James Rich / Michael Spiro, Michael Spiro – 1st Edition, Nuclear reactions.